With unlimited options on the market, choosing the right sweetener can be overwhelming. Some of the more popular options include sugar, honey, maple syrup, agave or a variety of artificial sweeteners. Maple syrup and white sugar are both derived from natural sources and contribute calories and carbohydrates to your daily intake. However, they vary in the amount of processing required to make them and in their nutrient content. Pure maple syrup is relatively unprocessed. Sugar maple trees are tapped for sap and the sap is boiled to concentrate the liquid into syrup. Sugar, on the other hand, which is made from either sugar cane or sugar beets, requires a large amount of processing that usually occurs in factories. The cane or beets are mixed with hot water, boiled and mashed to release the juices. Different chemicals may be used at various points in the refining processing including lime, diatomaceous earth and phosphoric acid. The juices are then filtered and whitened using carbon, bone char or an ion exchange system. The granulated sugar is finally produced when the water evaporates from the juice. Due to the in-depth refining process required to make white sugar, no vitamins or minerals are left in the final product. Maple syrup also lacks vitamins; however, it contains a variety of trace minerals in different concentrations. For example, pure maple syrup contains small amounts of calcium, iron, magnesium, potassium, zinc, copper and manganese. These minerals play essential roles in your body, including cell formation, immune support, maintaining healthy red blood cells, keeping bones and teeth strong, regulating muscle contractions and balancing fluids. Maple syrup and white sugar are comparable in their macronutrient content. Neither sweetener contains any fat or protein. 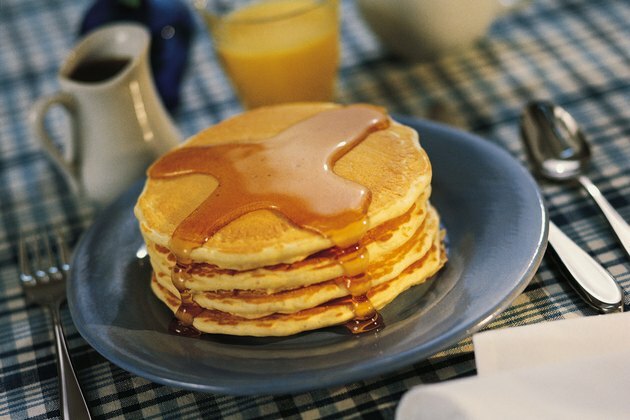 Maple syrup provides 52 calories per tablespoon, while white sugar provides 45 calories per tablespoon. This makes both maple syrup and white sugar calorie-dense, meaning they provide a large amount of calories relative to the volume of food. To avoid overeating and potential weight gain, be aware of your portion size when using either sweetener. The sweeteners are also comparable in their total carbohydrate and sugar content. Both provide 12 to 13 grams of carbohydrate per tablespoon, all of which comes from sugar. These foods are simple sugars, meaning they digest quickly and are absorbed into your bloodstream rapidly. Eating too many simple sugars may cause an elevated blood sugar, which is particularly harmful if you have diabetes. According to the American Dental Association, high intakes of sugar can also lead to dental decay and cavities. The Vegetarian Resource Group: Sugar and Other Sweeteners: Do They Contain Animal Products? Which Has More Calories: Brown Sugar or White Sugar?